BEWARE!!!! SPOILERS SPOILERS SPOILERS!!! Zom-B Bride is the tenth book in a series so there are bound to be spoilers for the previous books in the series. If you have any intention of reading the Zom-B series then please DO NOT read on because I do not want to be responsible for ruining a major plot point or twist! You have been warned! Read on at your own peril!! Official synopsis: "B Smith has been reunited with the murderous maniac clown, Mr. Dowling. To her shock and consternation, he's desperate to make B his partner in crime. Mr. Dowling disgusts her, but B thinks she can see a way to control him and maybe even save the world. But it will involve a sacrifice far greater and more surreal than any she has contemplated before..."
All good things come to an end and it is always a shame to see them start to wind down, and you would think by now, ten books in to a twelve book saga, most threads would of been tied together by now, but not with the Zom-B series, oh no! There is still life in the old gal and for now she is on full steam ahead, rattling towards what is sure to be a cataclysmic finale, and until that point there is still a lot of shocking to be done, and Zom-B Bride is most definitely full of shocks. Physically and metaphorically speaking too! Things kick off pretty much where they left off with the last instalment, Zom-B Family. B has seemingly made a pact with the devil as it were to save the lives of the humans left in the power station and has somewhat willingly handed herself over to her enemies, and if anything she's glad of it. We finally get to see the inner workings for Mr Dowling's operation. His plans, or sometimes lack thereof and of the life he led before the zombie apocalypse that has left the world so ravaged and broken. I particularly liked the scenes were Mr. Dowling let B into his head and the things that went on there, how he seemed like a normal man before the bloodlust and insanity took over. We also learn more about his origins and that I found particularly interesting. And of course as the title suggests, it wouldn't be a wedding without a blushing (well, can zombie's actually blush?) bride would it? I loved the scene where Mr. Dowling "fixed" B. Almost like DanDan's torture scene but in reverse. It provided the signature Darren Shan gore whilst still keeping things fun and keeping readers on their toes. The writing, as ever, is impeccable and unquestionable. 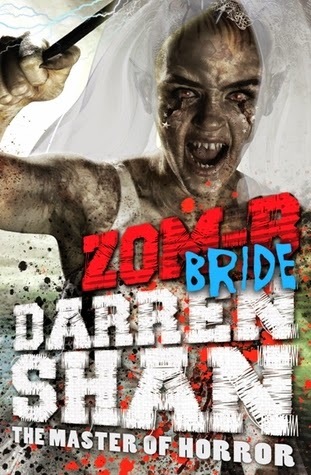 Mr. Shan is a master at what he does and with two final instalments to come, and a shattering conclusion at the end of Zom-B Bride leaving B in more danger than she has ever been in, I just do not know if my heart can take it. But I'll sure as hell enjoy finding out!